the game the Yankees played in Detroit would definitely qualify as drama. You had a starting pitcher who needed a big performance to keep his place in the rotation—because no matter what the manager has said up to this point, that pitcher’s spot was going to be questionable if he failed in Detroit—and you had the offense which needed to score some runs, badly. Thankfully for the Yankees, both things happened, even if the end result, a 5-4 win, came after a particularly sweaty seventh, eighth and ninth innings. “Big Mike” finally showed up. 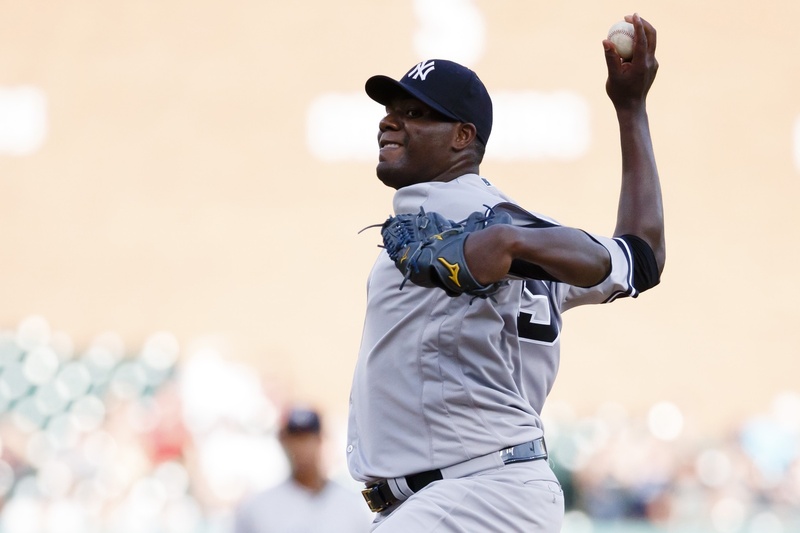 Pineda had been struggling early in games this season. He had a first inning ERA of 13.00 coming into the game against Detroit and just when it looked like things would be heading in that same direction, he got a much needed double play off the bat of Victor Martinez to end the inning without any damage after a double by JD Martinez and a single by Miguel Cabrera. A big key for Big Mike was his slider. It was back in a big way on Thursday. He threw 32 of them and thanks to that slider, he got eight strikeouts—six were off the slider. The other story of the night was the offense which started off slowly against Detroit’s starter, Matt Boyd. So slowly that Boyd had a perfect game after four innings and was throwing a no-hitter going into the sixth. Fortunately, the Yankees made adjustments and scored a run in the sixth and four in the seventh. Rob Refsnyder doubled in the sixth to break up the no-no and singled in the seventh to break the 1-1 tie. The big three came in to relieve Pineda and all three of them had issues. And two of the three, Andrew Miller and Arodlis Chapman, were aided by spectacular defense in the latter innings. All three gave up a run, they all gave up at least one hit—Chapman gave up two—and Miller walked two. Dellin Betances recovered well in the seventh after giving up a walk, a wild pitch and a double by striking out the side. Chapman closed the door after making things very sweaty in the bottom of the ninth and the Yankees will have a happy flight to Baltimore. And even if WPA doesn’t think so, the double play that Didi Gregorius started in the ninth, saved the game for both Chapman and the Yankees after Chapman worked himself into a bases loaded, no out jam. “Wait, did the Yankees actually score five runs?” – my brother, James Gotsulias Yes, James, most of us can’t believe it either. The Yankees travel to Baltimore for a three-game set this weekend against the Orioles. Nathan Eovaldi (3.55 DRA) will start things off for the Yankees on Friday night. He is looking for his seventh victory of the season. Eovaldi has become one of the starters that Yankees fans are relived to see on the mound which is a nice change from earlier in the season. He will be facing O’s starter Chris Tillman (3.55 DRA) who is looking for his eighth win of the season.